Forms, tickets, padded receipts and MORE to keep your business busy! On-demand forms in standard and custom sizes. We can duplicate forms you've been using or work with you to create something that tailor-fits your event or business needs. YES! Perforated and tear-off pads as well as full-color forms are available. Ask us to help create a new way for you to Do Business! 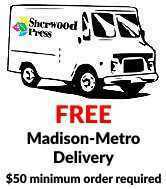 Sherwood Press offers a variety of forms with customized features. Contact us or call with ideas! Page Summary: Sherwood Press offers carbonless forms, customized forms, invoices, print forms, order forms, print shop, printing services, business form, printing companies, custom forms in Madison, Sun Prairie, Monona, Windsor, Waunakee, McFarland, De Forest, Fitchburg, Cottage Grove, Oregon and surrounding Dane County communities.